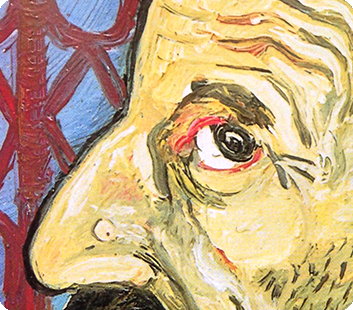 This is a three-stages project about Antonio Ligabue and the two places that marked his life and art: Switzerland, where he was born and lived his first eighteen years, and Gualtieri (Reggio Emilia, Italy), on the banks of the Po river, where he created most of his paintings and sculptures. The Square of Gualtieri struck me for its rational lines, and because its then-famous 16th Century architect designed every angle, column and shadow to mirror a carefully planned “cosmogony of the town”. But that alone is not reason enough for a project. The Square of Gualtieri struck me because its extreme architectural rationalism was violated by the madness of Antonio Ligabue in the 1900s. Ligabue's “irrationality” is the foundation of his art. He desecrated the rigorous perfection of that square with his imperfect nature of village idiot, hitting himself in the face with a stone, screaming in rage and pain when he was made aware of a disparaging comment on his paintings. Both the Square and Gualtieri itself struck me because they appear very rarely in Ligabue's paintings. Toni - as Gualtieri's inhabitants used to call Ligabue - always preferred to paint Swiss landscapes, the places of his own mythicized childhood and lost happiness. 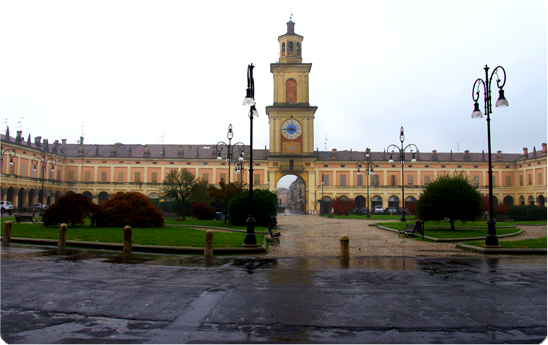 Toni, forcedly extradited in Italy in 1919, agreed to live most of his life in Gualtieri because of the nearby Po river. 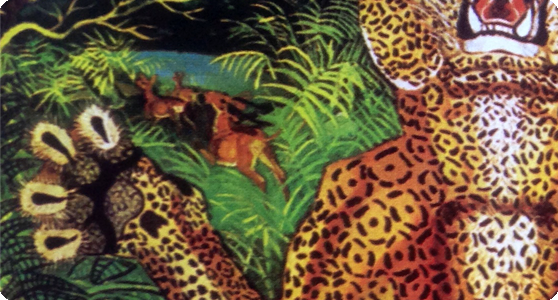 On those banks, Ligabue could isolate himself from civilization and connect to his inner world and nature - a nature so wild, it could become the hunting grounds for the big cats in his paintings. This is where “my” Ligabue lives: not in the center of the square, but always on the edge, along the banks, in the countryside, where the harshness of life and nature were crude enough to feed his feverish pictorial imagination. Here he is, pushed to the square by a river flood and then sucked back into nature by a river drought. Here he is, merging into Mother Earth as he chews the Po's clay to knead bodies and faces. Here he is, mixing Swiss roofs and houses with river ferns, and right in the center, his face... His eyes looking elsewhere, refusing to make contact with ours. These thoughts and feelings pushed me to tell the fight between the “Swiss man” Ligabue, his interior landscape, and the village of Gualtieri on the banks of the Po. That's why I looked again at what happens over the border, after looking over other borders in my previous project on Italian migrants, and that's why I explored the creative madness that changes the perception of things and places. 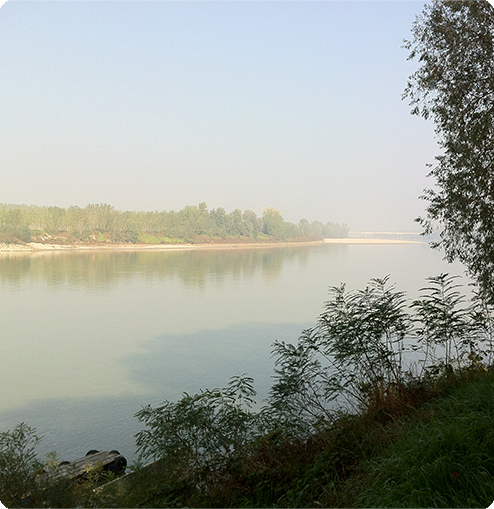 I saw the Po river as a border, and I saw Ligabue leave that border behind. 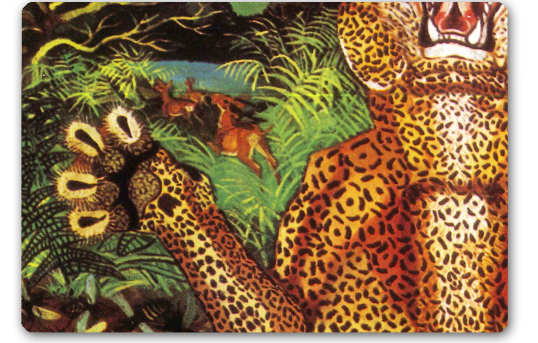 And I took this chance to go back to the anxious feeling I had when I was a child, and I looked at the popular Antonio Ligabue fiction on TV. If you look at Ligabue, you have to also look at the bindings between a community and a “village idiot” who was feared and pushed to the border. You have to embrace a different view, the view of madness, tipping your balance and whispering again that old question: Who's the crazy person here? Finally and beyond any rational description, I can't avoid following my own fascination, maybe an ancestral attraction for the animal Antonio Ligabue. That pure, feral core that Ligabue persistently sought in his work, flaunting it back at us with incomparable brutality.